Ed. 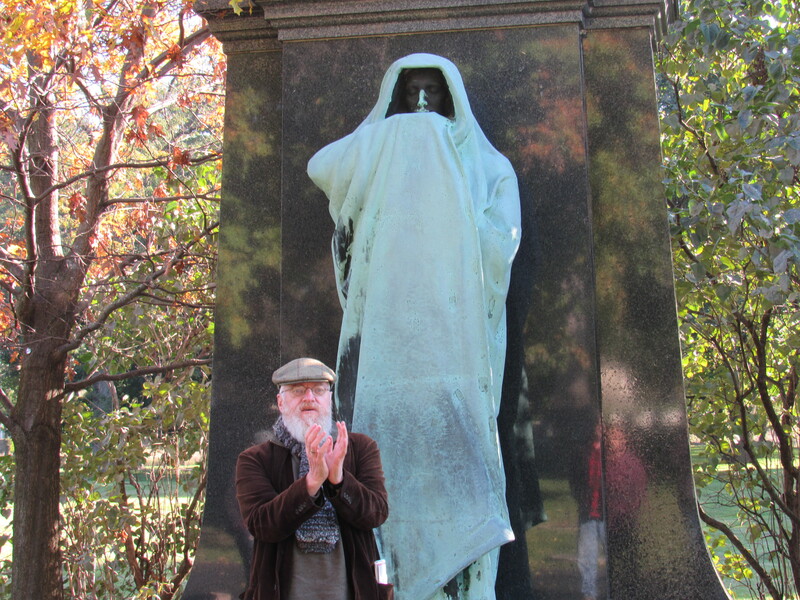 note: They say the veil is thin between the living and the dead on All Hallows' Eve. What better place than an urban cemetary to reflect on this opaque boundary? As resting places for the dearly departed and tributes to the holiness of habitat, urban cemeteries offer unique opportunities to consider the cycles of death and life. Share your own stories of urban cemetery experiences in the comments! I recently began organizing an urban nature walking group with my friend and fellow peripatetic Liam Heneghan. An Irishman with a fondness for spinning a yarn, Liam is a soil scientist by training but a poet by instinct. He looks the part, bespectacled and brandishing a long salt-and-pepper Whitmanesque beard that serves as a stray pencil holder. From him, I’ve picked up Irish double negatives like “that’s not nothing” as well as an appreciation of the tin whistle, an accoutrement always tucked into his vest pocket in case inspiration strikes. Perhaps Liam first suggested that we spend some time in cemeteries. He’s a bit of an arborist, so this would make sense, since many cemeteries serve as accidental arboretums, protected areas where trees from around the world can be found. Besides parks and some city shorelines—though much less frequently trafficked—cemeteries most closely approximate an intergenerational public commons. Truly intergenerational. Seen from above, they become islands of green surrounded by the dark waters of pavement, clearly set apart and honored as sacred spaces. Few natural areas in the city garner that degree of deference. The workaday world is not allowed to intrude; convenience stores shall not pass. Cemeteries bend time, revealing wayfaring as more than a present tense activity. This type of pathmaking includes those who have come before us—our traces reach through place and time. When walking among the gravestones, you walk lands that respect the dearly departed and, by default, provide habitat to the still thriving. 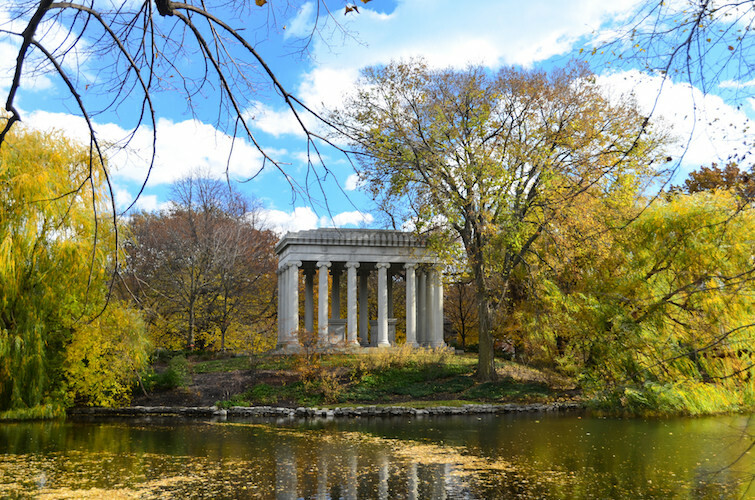 Graceland Cemetery. A glorious autumn day. Maple trees in spasms of gold and scarlet. Liam chose this cemetery for our group walk since it’s one he knows well. About twenty of us are here, eager to see the interior of one of the larger patches of city greenspace. Liam leads us along, stopping at various trees and adopting a role as charismatic undertaker. He talks decomposition, twirling an oak leaf above his head, drawing the group’s attention to the tannins that become visible in fall leaves as they go to ground, a tree’s chemical defenses against herbivory now exposed in the rash of colors all around us. Beautiful poisons. I pick up a maple leaf the color of a tequila sunrise, a dying ember fallen from the sky. When I flip the leaf over, an intricate network of capillaries become distinct. Perhaps because of the shape of the five-pointed leaf, the correspondence with the veins in my five-fingered hand becomes shockingly clear. A strong sense of kinship floods my body. Leaves are trees reaching out, the expression of their longing for the sun made visible in the imprint of these lifelines. We are all yearning for connection—the leaves above my head, beginning to turn toward their deserved seasonal rest; the roots underneath my feet, making slow traces through the soil, seeking ongoing nurturance. For a moment, I feel I am merely an uprooted tree, tracing my way through this cemetery in search of connection. Liam continues to pontificate on the glories of leaf litter, while I look at the weathered headstones encircling us, thinking of other kinds of decomposition. There’s something democratic about the work of soil. Graceland boasts a good number of elaborate obelisks, filigreed mausoleums, and unusual sculptural flourishes—hooded figures, Marian tributes, and angel wings—but time has taken a toll. Names and dates are fading, some of the older headstones offer only faint incisions in stone. Rain streaks and runnels continue the work of water, returning the seemingly permanent back to earth. No matter what fame a person accrues in a lifetime, no matter the monuments built to preserve that memory, cemeteries insist on recalling the larger cycles of which we are a part. Death generating life. No matter who you are. The remains of a few notable Chicagoans now feed the grass at Graceland. Our cohort of walkers basks in the dappled sunlight, and a member of our group, Dan, nudges me with an elbow and nods his head toward his iPhone. The screen displays a snapshot of the grave markers opposite us, across a small pond. Dan points with an index finger and I lean in for a closer look. Coyote. I raise my eyebrows and look up at Dan. With his line of sight, he indicates the place where he aimed the camera. Nothing. Of course, coyote—the boundary crosser—would be here. And then not here. Observing, disappearing, a cemetery mischief-maker and ghost of broad daylight. No one else in our group notices. 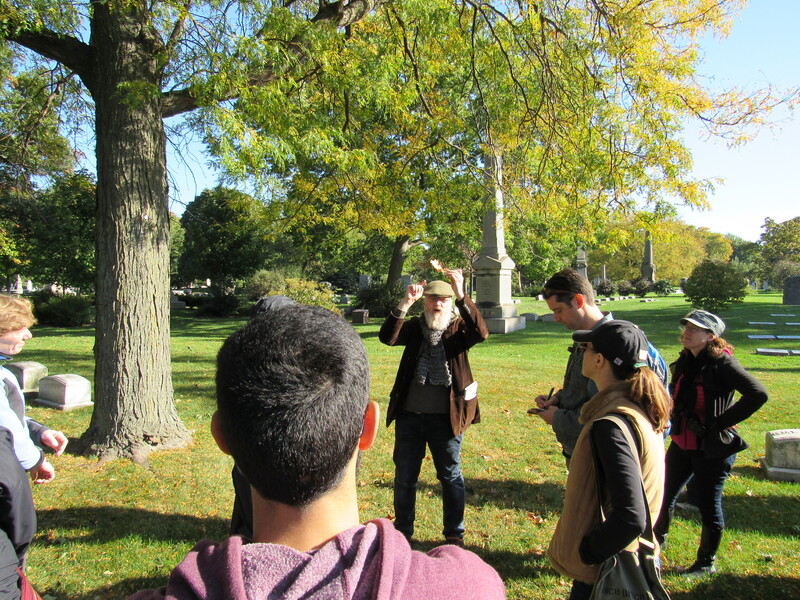 When I tell Hannah, an anthropology PhD student at the University of Chicago, of the coyote in our midst, she mentions that she and a team of graduate students recently conducted ethnographic research at another Chicago cemetery. Chinese families visit in order to leave offerings at the graves of their loved ones, including food items, honoring their departed ancestors. The food doesn’t last long. Hungry ghosts? Hannah suspects the coyotes she’s seen darting between tombstones are supplementing their diet with these ancestral offerings. The food may not reach the intended destination, but it feels like a fair exchange to me. As I walk the peaceful paths of Graceland, attempts at separation appear. Money is needed to chisel elaborate grave markers, a last flourish of extravagance and status. I see masonic insignia on many headstones, signaling secret societies and male bonding, as well as last names that favor particular ethnicities and social classes. The work of the soil may be democratic, but the work to keep like with like takes cash and influence. I derive some comfort in knowing that no matter how ornate the concrete between bodies and the soil, the roots will eventually find their way inside. 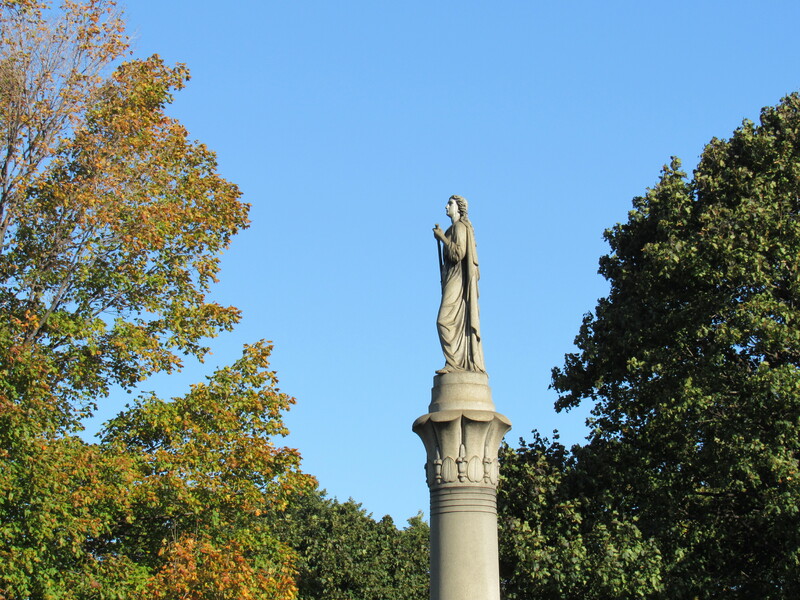 These thoughts flit through my head as our group arrives at what, for me, is the sacred heart of Graceland, though it is tucked into the far southeast corner of the cemetery. The landscape here is unmistakably distinct from the well-manicured and orderly grasses surrounding it. Purple prairie clover seed heads and yellow coneflower bob in the wind. A path disappears into a tangle of tallgrass prairie. Field sparrows flash between the stalks. Sometimes what is sacred is salvaged. 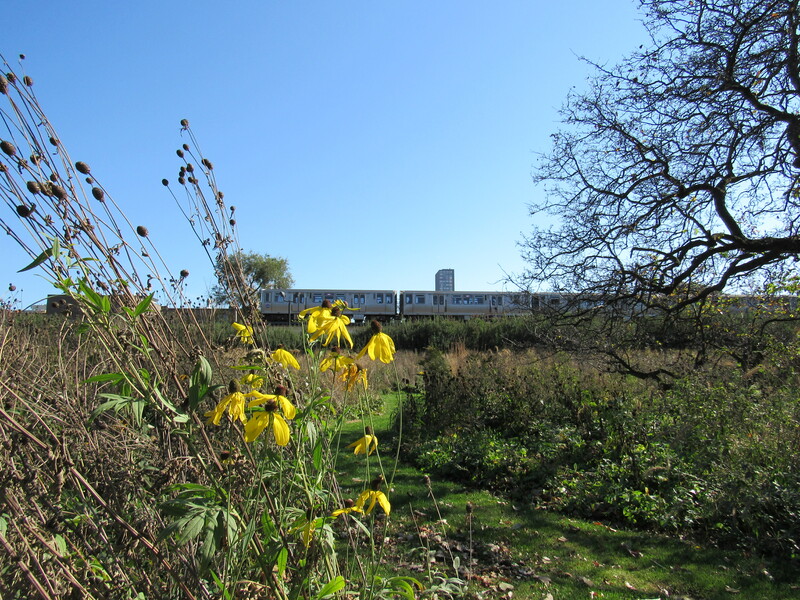 Several cemeteries in Chicago—whether by happenstance, neglect, or as token tribute to the place’s original appearance—contain prairie remnants that stand tall in these feral corners, all that remains of the pre-urban landscape. They are memorials to tallgrass, more important, to my eyes, than any individual’s headstone at Graceland. I let the group outdistance me, hanging back and taking my time. I wind through the fingers of tall grass and inhale the loamy scent. Seed heads are bursting open. 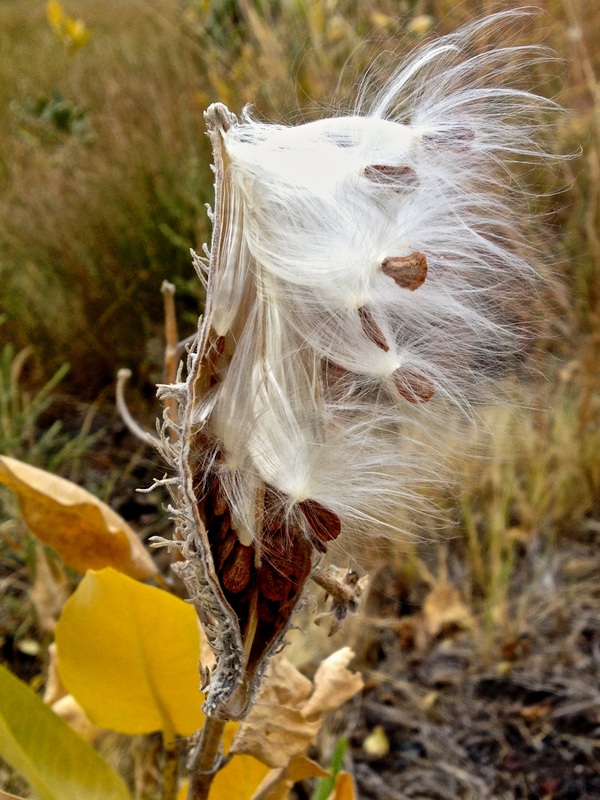 Milkweed pods are split in two, the white comet tails of their seeds fluttering before launch. Most of the cemetery honors the dead. Here the honor is to the living. And the living come to remember, so that memories don’t slip too quickly. These patches embody worlds that preceded the city, places to touch the sacred past-and-present-and-possible-future with one’s fingers. Cemeteries are typically associated with solemnity and grief. Not for me. I come to the commons of Graceland to remember to live better, sweeter, to support those cycles that endure beyond a human lifespan. That’s not nothing, Liam might say.